It’s the holiday season – Thanksgiving, Christmas, all that jazz. The holidays, more than any other time of the year, are a time of traditional foods – of stuffing, turkey, mashed potatoes, pie and, yes, cranberry sauce. Of course, just because something is a tradition doesn’t mean Trader Joe’s isn’t going to try and find some way to screw with it. Case in point, the brand new Trader Joe’s Jalapeno Cranberry Sauce. When I first saw this, I initially assumed it was some new sort of festive pepper jelly. You know the stuff – comes in little jars, thick like jam, people spread it over cream cheese, only ever shows up around the holidays? That stuff? While pepper jelly and this cranberry sauce do have the same burgundy color the two condiments are actually very dissimilar. After all, this is a cranberry sauce – same as the gelatinous stuff you get in cans and serve with the stuffing. It’s not even particularly thick, and while it certainly might be a nice compliment to cream cheese, that’s not what it was made for. As a cranberry sauce, its natural home is in between the turkey leg and the mash potatoes. Now, cranberry sauce has a long tradition of being blended with any variety of different flavors – orange zest being the most common – but jalapeno peppers? That’s something I’ve never seen. That said, this jalapeno blend is a natural addition to the cranberry sauce oeuvre. Cranberry sauce is, after all, not so much a sauce as it is a relish – meant to add a burst of outrageous flavor to your seasonal repast. On that count this cranberry sauce works very well, the heat the jalapenos pack melds well with the tart sweetness of the cranberries, kicking the sauce up to a whole new notch of flavor intensity. When Trader Joe’s gives “jalapeno” top billing on the label, you know they’re not screwing around. There’s no mistaking the jalapeno taste in this sauce, but that’s not to say it’s very spicy. There’s only a mild heat to each bite – much more prominent is the flavor of the jalapeno itself, that uniquely green and peppery taste. It’s this savory flavor that mixes with the sweet cranberry sauce, and gives it its overall unusual but intriguing taste. This new and intriguing taste is certainly something worth trying, but while there’s no reason you couldn’t put it out this coming Thanksgiving you’ll probably want to have some ordinary cranberry sauce on hand as well. It’s a bold and striking flavor, but that doesn’t necessarily mean you’ll want it on every piece of turkey. If your jar of Jalapeno Cranberry Sauce doesn’t get used up on Thanksgiving dinner, you might consider using it as an hors d’ouevre. It could easily be used as a tarter substitute for pepper jelly in the aforementioned cream cheese and pepper jelly spread. Simply lay on a thick layer of the cranberry sauce over a slab of cream cheese and garnish with an interesting cracker – Trader Joe’s Pita Crisps with Cranberries and Pumpkin seeds could be an excellent fit. 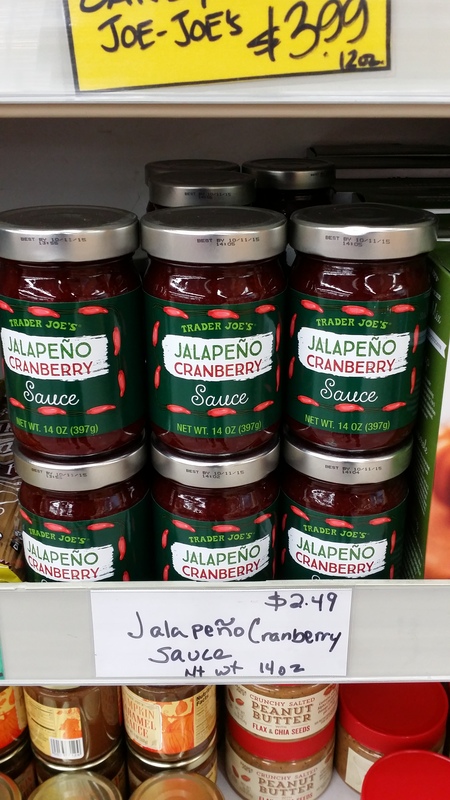 Otherwise, unless you’re serving up a uniquely Mexican-flavored Thanksgiving/Christmas dinner, Trader Joe’s Jalapeno Cranberry Sauce is probably best thought of as a back up to your main cranberry sauce. Would I Recommend It: Certainly, and doubly so to flavor-thrill seekers and people looking to shake up the Thanksgiving table. Would I Buy It Again: Maybe… we’ll see how it goes over this year. Final Synopsis: A sweet and tasty relish to supplement to your ordinary cranberry sauce.